(Nanowerk News) An international research team has developed a highly efficient novel method for simulating the dynamics of very large systems potentially containing millions of atoms, up to 1000 times more than current conventional methods ("Stable and Efficient Linear Scaling First-Principles Molecular Dynamics for 10000+ Atoms"). 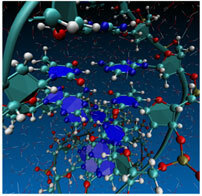 Snapshot structure from first-principles simulation of DNA in water medium using the calculation method developed by the research. The forces between atoms are calculated by first-principles calculation (joint research with RIKEN) This advance will open up a range of possibilities for accurately studying complex matter, for example biomolecules in solution, and gaining a previously unattainable understanding of processes such as electron, water or ion transport or chemical reactions. Matter is composed of atoms, and its physical characteristics are determined by the complex interactions between atoms and electrons. Theoreticians use quantum mechanics to calculate the forces between atoms, and the behaviour of electrons in materials. Specifically, first-principles simulations are based on quantum mechanics, and are a powerful technique widely used to uncover diverse properties of matter and materials at the atomic scale. The research team, led by TYC member David Bowler, UCL and NIMS MANA and Tsuyoshi Miyazaki at NIMS, used high performance computing to introduce a new technique, where the time required for the calculations increases linearly with the number of atoms, to perform first-principles dynamical simulations of systems comprising more than 30,000 atoms, 100 times larger than is usual with conventional methods. The technique has further been used to calculate properties of over 2 million atoms. This new method will be an invaluable tool for those using predictive computational modelling and, as most simulations are stuck below 1,000 atoms, it will open the doors to studying completely new areas of physics.